Gareth Long - Education: Rum Cake - all for the sake of work - honest! As we have spent the last few days preparing a major visual demonstration for the Minister to give at a World Ministers of Education conference in London early January, we had to take a photograph of a rum cake. Why rum cake? - well Cayman is best known as being one of the largest financial centres in the world, and also as a top tourist destination. 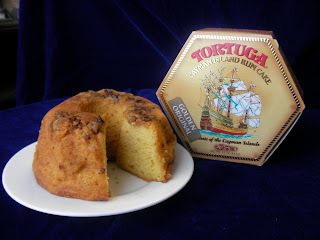 Less well known though is that its largest tangible export is ..... rum cake - thousands every day. Having bought the cake, we worked in my office taking dozens of photographs. I thought it would look better sliced open.... the team working with me were happy to oblige. Lots of smiles, lots of crumbs - never was quite sure where the big slice went :) Needless to say it is absolutely delicious and as soon as the photoshoot was completed Ministry staff appeared from everywhere and the cake vanished just as fast! I do recommend it if you haven't tried it - hic! The black background makes it difficult to read the bloggs. In response to this comment I have made the text white, as opposed to light gray and also changed the font to verdana. I hope that this helps! Does it?